"There's no such thing as a painless lesson. They just don't exist. Sacrifices are necessary; you can't gain anything without losing something first. Although, if you can endure that pain, and walk away from it, you'll find that you now have a heart strong enough to overcome any obstacle. Yeah... a heart made Fullmetal." This page deals with Hiromu Arakawa's original manga and its direct anime adaptation (titled Fullmetal Alchemist: Brotherhood). For the loose 2003 anime adaptation, please see Anime.Fullmetal Alchemist. Created by by Hiromu Arakawa and running between August 2001 to June 2010, Fullmetal Alchemist (Japanese title Hagane no Renkinjutsushi) follows the story of the Elric brothers, Edward and Alphonse, who live in a world where those who know how to do so can practice the art of alchemy (transmuting one material into another or reshaping it into new forms). The brothers' skill with alchemy at an early age led them to believe they can bring their recently-deceased mother back to life using human transmutation — a forbidden, taboo practice of alchemy. Their hubris costs Ed his right arm and left leg (now replaced with artificial "automail" limbs) and leaves Al as a soul affixed to an empty suit of armor. Years later, the brothers set out to find the Philosopher's Stone, a legendary artifact said to allow any form of transmutation without the necessary Equivalent Exchange. The government tightly controls knowledge about the Philosopher's Stone, however, so Edward takes — and passes — the State Alchemist Examination to become "a dog of the military" and gain access to the State's information. The brothers also do the government's work by traveling around the country and solving problems, though trouble often finds them first. As the Elrics dig deeper into the mystery of the Philosopher's Stone and search for a way to create one, they stumble onto truths about their family and friends, the military, the Stone, and even the very nature of alchemy itself — and they also discover a vast conspiracy led by dark forces who wish to use their search for their own reasons. In 2003, the manga was very loosely adapted into an anime series. While it followed the story at first, it quickly spun off in another direction, and ended up with an entirely different conclusion altogether. This was pretty much inevitable since the manga was released in a monthly magazine; the weekly anime would have tons of filler to make sure it didn't overrun the story. For more information on this series (and the tropes and characters involved exclusively in its own canon), check out its own page. In 2009 — as the manga was nearing its end — a new anime series (Fullmetal Alchemist: Brotherhood) was announced; it followed the manga's story much more faithfully (with nearly no filler) while skimming through material already covered in the 2003 series (so it could get to where the 2003 series went off-track). When it was released in the US, nearly the entire original cast of the 2003 series' dub reprised their parts, to boot. For anyone who wants to watch an accurate animated adaptation of the original manga, this is the series to watch. 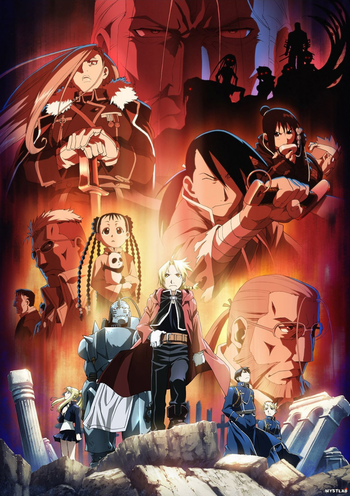 After the end of Brotherhood, a movie set within the series — Fullmetal Alchemist: The Sacred Star of Milos — was released in 2011 (and 2012 for the US). Unlike The Conqueror of Shamballa (a film based off the first anime series), this film exists as a side-story to the manga/Brotherhood. In the US and Canada, Viz Media licenses and publishes the manga series, while Brotherhood is available on Crunchyroll and Netflix, both dubbed and subbed on both sources. (The 2003 anime can be found on Netflix as well.) Elsewhere in the English-speaking world, Brotherhood is licensed to Manga Entertainment in the UK and Ireland, while Madman Entertainment distributes both the show and the manga in Australia and New Zealand. A live-action film adaptation was released on December 1, 2017. A Recap can be found HERE.